On Sunday June the 3rd 2018, Snobs Creek Hatchery will be holding an open day from 10am-2pm. This is a free event and is part of the Victorian Government's Target One Million plan that is designed to get more Victorians involved in recreational fishing. There will also be free tours of the facility, where visitors can learn about the history of the hatchery and how the fish are bred, raised, sorted and distributed throughout the state. It's also a great opportunity for children in particular, to learn about the life stages of the fish and see them up close. For those wishing to purchase food and/or drinks on the day, there will be food vans and stalls. Snobs Creek Hatchery is located in Eildon, about 140km north-east of Melbourne. The hatchery has been operating for 70 years and produces millions of fish every year, including Murray cod (Australia's largest freshwater fish), Brown trout, Rainbow trout, Chinook salmon, Trout cod and Macquarie perch. The fish are transported throughout the state and then released to ensure that recreational fishing in Victoria remains sustainable for years to come. 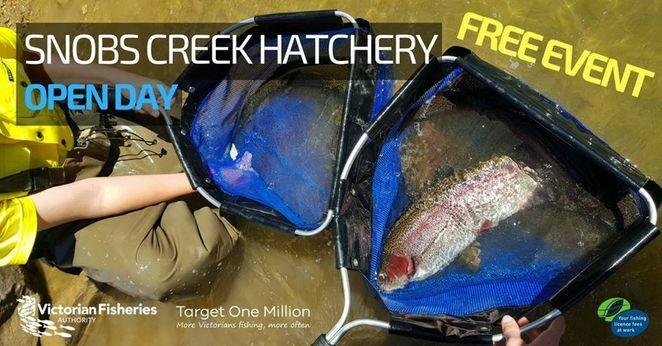 For more information and updates, check out the Snobs Creek Hatchery Open Day Event Page on Facebook.